RUSH: What’s going on in the fiscal cliff argument is very simple. Barack Obama wants the Republican Party to essentially destroy itself. Of all things, when you think of the Republican Party, what do you think of in terms of what it stands for? Tax cuts for everybody. The Republican Party stands for you keeping more of what you earn. The Republican Party stands for — well, at least it used to, but the image of the Republican Party’s tax cuts. Certainly not tax increases. 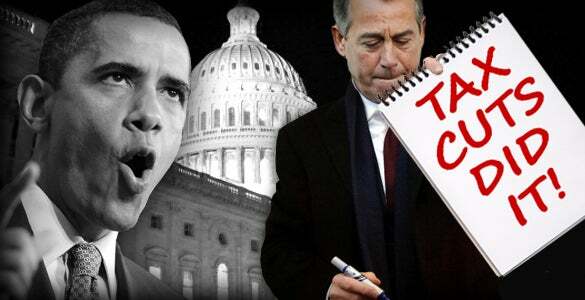 What Obama is attempting, in the fiscal cliff deal, is to get John Boehner and therefore all Republicans to confess. If he can get the Republicans to raise taxes on the rich, then Obama feels he is helping the Republicans destroy their brand, destroy how it is that they’re known and understood. And in the process, what are we talking about? The fiscal cliff, what’s that? We’re trying to save the country. What Obama wants is for the Republicans to agree that tax cuts, from Reagan forward to Bush, created the current climate. The recession is because the rich didn’t pay their fair share. In fact, the entire situation of economic inequality is because the rich haven’t paid their fair share. They want the Republicans, by agreeing to raise taxes on the rich, to essentially confess that it’s been tax cuts, low taxes on the rich that explain the economic calamity. Not liberalism. Not wanton federal spending. Not socialism. Not Obama. Not the Democrats. Not entitlements. Not spending. No, none of that’s to blame. Those are all the fixes, you see. All the Democrat policies are how we save America from what the Republicans believe in: tax cuts for the rich. At the end of this, if Obama gets his dream fulfilled, the Republican… Again, Boehner’s not gonna call a press conference and say, “I give in! I confess! We’re guilty.” That’s not what… Nobody’s gonna have that happen. Obama’s gonna be able to say it. The media will be able to say it. “Republicans acknowledge tax cuts are to blame for your home value being underwater! Tax cuts are the reason you don’t have a job! “Tax cuts for the rich are why we have such income inequality! Tax cuts for the rich are the reason for everything that’s wrong economically!” That’s what Obama wants. This is politics. It’s about destroying the Republican Party. You look at the Obama’s modus operandi. From the time he was in the Senate in Illinois all the way forward, the way he runs is to clear the playing field. This talk about leveling the playing field? Look how easy it has been for Obama and the Democrats in the public education system to totally distort what the American people think about their own history, about the founding their country. About freedom. About liberty. So if they succeed in getting Republicans to confess, to acknowledge that there haven’t been enough taxes on the rich, and that’s why there’s all this economic trouble, the next Republicans that runs for office on tax cuts is gonna be laughed off the stage. “President Barack Obama won the public argument over taxes so decisively that almost half of Republicans now say he has an election mandate to raise rates on the rich. Majorities of about 2-to-1 also read the election results as an endorsement of ObamaÂ’s pledge to protect Social Security and Medicare benefits…” So, almost 50% of Republicans — not quite but almost 50% of Republicans — say Obama won a mandate to raise taxes on the rich. And almost 50% of Americans say that Obama’s election means no cuts to Medicare, Social Security, or entitlements. Republicans think this! This is not a poll of Democrats. This is a poll of Republicans. Almost 50% believe Obama has a mandate to raise taxes on the rich. How has that happened? Isn’t the answer pretty easy? The Republicans have not had the guts to campaign for tax cuts. Well, they haven’t had the guts to explain their value. They haven’t had the courage or whatever. I don’t know what it is. They just haven’t done it. I’m not gonna make it a question of courage. I don’t know. They just haven’t explained to people who Obama is and what he is, where he comes from, and what he wants. And they have not explained the economic value of lower taxes to raise revenue and grow the economy, which is good for everybody. RUSH: Here’s Doug as we start on the phones. Great Falls, Montana. Welcome to the EIB Network, sir. Hello. CALLER: Good to talk to you again, Rush. CALLER: I get a laugh every time I hear these people say, “Oh, the unions were great when they started.” The unions weren’t great when they started. They were nothing but a bunch of communists who teamed up with Tammany Hall, the most corrupt organization that ever came along, and then eventually were taken over by the American Mafia which saw a golden goose that would lay a never-ending stream of golden eggs. The America Mafia, I think, controlled the unions until the second coming of the American Mafia being the Democrat Party. They took ’em over completely in the eighties and the nineties. RUSH: Right, and there was some internecine warfare between the two mob groups and there were some people that got wiped out. CALLER: Exactly. And I think that the true cream has risen to the top in terms of who’s the most corrupt. I think what we’ve got now, I don’t think “Lepke” Buchalter and Charlie Luciano could be prouder of the criminal organization that runs this thing right now. And, Rush, if there’s time I’d love to ask you a question that’s bugged me for years. RUSH: Quickly, what’s the question? CALLER: What, 120 million people voted in this election, approximately, correct? RUSH: I think. I don’t know. RUSH: I’ll take your number. CALLER: Okay. What did the other 80 million eligible voters do, and who are they? RUSH: Well, I’ll tell you this. Here’s one stat. Four million white people who voted in 2008 didn’t vote in 2012. In a supposedly racist country, four million white voters that voted in ’08 didn’t vote in 2012. RUSH: Look, I’ll tell you what I was sharing with some of the others. There really isn’t that much suspense on the fiscal cliff. Let’s look at rates for the rich. They’re gonna happen. This is the point. Rates for the rich are going to go up one of two ways. The Republicans either agree to it, and if they don’t, we go over the cliff. Going over the cliff raises the rates. The thing about going over the cliff is, they raise rates for everybody, and I still maintain this is what Obama wants. Now, stick with me on this. Look, I’m not trying to sound like a know-it-all. The media is trying to concoct all this suspense and drama. There really isn’t much. From the wish list of the Democrats and Obama, it’s pretty easy to ascertain what’s gonna happen here. The rates on the rich are either gonna go up because the Republicans agree to it, or we’re gonna go over the cliff. Going over the cliff raises the rates. Going over the cliff means the current tax rates expire and they return to what they were in the Clinton years. For everybody, not just rich. Made to order for Obama. That takes us into the early part, the first quarter of 2013. And this is pretty easy to forecast, too. We go over the cliff, rates for everybody have gone up, and by the time this all happens, guess who’s gonna be blamed for it? Republicans and their intransigence, their refusal. This is what’s got ’em scared: being blamed for all this. They don’t have a way of shifting the blame back to Obama. There is. I don’t know if they want to employ it. So we go over the cliff, everybody’s rates go up. The media blames it on the Republicans for trying to protect tax rates for the rich. And because the Republicans would not cave and would not agree to raise taxes only on the rich, and thus prevent the cliff, everybody’s rates go up. And here comes Obama in the white hat on the white horse to save the day. And he’s gonna propose, guess what? Tax cuts for the middle class. And thereby take the issue away from the Republicans. Tax cuts for the rich, they will own. It will be blamed for all the problems. Obama will come in, as the savior, propose tax cuts on the middle class, everybody but the 2%, the Republicans can’t oppose that. You know what else he’ll do? He’ll put some of the defense spending back that also gets cut because of the cliff, ’cause that’s another major part, sequestration, defense budget gets cut going over the cliff. So Obama will come back and he’ll propose to rolling back the rates on the middle class, everybody but the 2%, roll those rates back to Bush rates. And, by the way, Obama will then go out there, “I think defense has been cut way too much. You know, I love this country. I want to defend this country. We need to put that back.” So he’ll get credit for defense buildup, tax-cutting on the middle class; and as part of this, Obama is then going to insist that there just essentially be no debt limit anymore. He’s going to say, “I want unilateral control over it. I want to be able to zoom past it,” in effect, wiping it out. This is going to take place within weeks of Obama’s two inaugurations. Do you realize there are gonna be two ceremonies, one public and one private, and they’re gonna gin this up as though it’s a coronation. It’s an immaculation. It’s gonna be the greatest thing, the first term times two. Obama’s gonna have all this love and adoration, all this glory, and he’s saving the middle class, he’s saving the defense budget, and all he’s gonna ask, for the good of the country, for the good of entitlements, can we get rid of debt limit? And there is no limit to spending increases then. That’s all gonna be seen as the solution, while tax cuts for the rich — he-he-he — remain the only reason why we are in economic malaise. The Republicans, what are their options in this? Well, they can prevent going over the cliff by agreeing to raise taxes on the rich and leaving the Bush tax rates in place for the middle class. They can then make a deal in the cliff that defense spending doesn’t get cut as much. Somebody needs to explain to me what is the benefit to Obama in letting the Republicans out of the trap of going over the cliff. I think going over the cliff is the most attractive option Obama has. And, by the way, does Boehner — I don’t know. You tell me. Snerdley, you follow this kind of minutia. Does he have the votes yet to stop any of this? I don’t know that he does. So all they’ve got at their disposal here is insisting on entitlement cuts. Why should Obama cave on that? There’s no reason for him to cave. He’s not under any pressure. Look at the polling data from Bloomberg. The majority of Americans are worried sick entitlements are gonna be cut. There’s no upside to cutting entitlements, not politically. And, by the way, don’t think anybody on the Democrat side’s worried about the country. They’re not worried about the deficit, the debt or any of that. You have to recognize that. You have to realize they couldn’t care less about any of that right now. This is all pure 100% undiluted politics. And what they see right in front of them is a chance to wipe out the Republican Party. I mean obliterate it. That’s what they see.